Drakkar Tashiding (Tib. བྲག་དཀར་བཀྲ་ཤིས་སྡིངས་, Wyl. 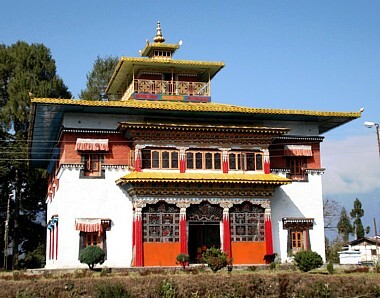 brag dkar bkra shis sdings) is the most sacred place in Sikkim, visited by Guru Rinpoche in the 8th century, and in the 14th century by the tertön Rigdzin Gödem (1337-1408), who established a monastery there. Tashiding Monastery sits on the top of a heart-shaped hill rising between the Rathong River and the Rangit River, in the heart of Sikkim  As one walks up to the monastery (about half an hour), a little before reaching the top of the hill where the monastery stands, a small path branches to the left leading to a nearby Shitro cave. On top of the hill is the monastery established by Sempa Chenpo Puntsok Rigdzin and his grandson Sempa Chenpo Rinchen in 1641. Inside the main temple there are two stupas containing relics of these masters. Behind the temple is a stupa cluster. On the eastern side of the stupa cluster is a self-manifested engraved Guru Rinpoche image (you need to ask for the key to the small shrine that houses it). In the four directions around Tashi Ding are the four sacred caves of Guru Rinpoche. In the 14th century, Rigdzin Gödem]] (1337-1408) established a monastery in Tashiding. In the 17th century, during the 1640’s, Lhatsün Namkha Jikmé (1597-1650) revealed the Rigdzin Sokdrup cycle in one of the four sacred caves that surround Tashiding. A legend relates to the three monks who consecrated the first Chogyal of Sikkim at Yuksom. Apparently, they saw an unusual phenomenon of bright light shining on top of the Kanchendzonga that reflected to a site near the place where the present Tashiding Monastery has been built. Also, a scented smell of incense and divine music was also noted. 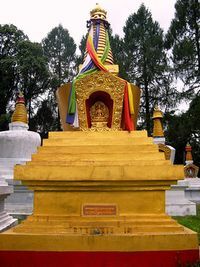 It was in Tashiding that the cremation of Jamyang Khyentse Chökyi Lodrö was performed and that a stupa was built by his own disciples, including Dilgo Khyentse Rinpoche, to house his relics. It was later gold-leafed by Orgyen Tobgyal Rinpoche in the 1990s. ↑ Tashiding, by Heather Elon. This page was last edited on 13 April 2018, at 18:48.